So we are now officially two weeks removed from the 2011-12 NBA trade deadline, and my favorite team happened to be involved in the biggest deal of that day. True fact: The Washington Bullards acquired The Most Sought After Free-Agent This Past Offseason for two dudes who might be as well known for their attempt at “The Cinnamon Challenge” as anything they ever did on a basketball court. Seriously! It happened! Look it up! DirecTV is running a commercial right now that begins, “When you have cable and can’t record all your shows you feel unhappy,” and ends with, “Don’t reenact scenes from Platoon with Charlie Sheen.” This commercial happens to lend itself quite nicely to welcoming Nene to D.C. while also reminding us where we’ve been this season with a team that made news too frequently for all the wrong reasons. Here’s a little warm-up to help you get a feel for what I’m talking about. let’s go get a StrasBurger!! OK, last one: When you begin your NBA season in rebuilding mode, JaVale McGee is your starting center. When JaVale McGee is your starting center, you have a young athletic phenom capable of three highlight plays per game, but also sure to miss double that number in defensive rotations, assist opportunities and free throws. When your starting center regularly misses defensive rotations, assist opportunities and free throws, the team and its fans grow apprehensive about his long-term prospects, especially as he approaches free agency. When everyone is apprehensive, your starting center becomes a trade candidate. When your young starting center becomes a trade candidate, deals come out of the woodwork as the deadline approaches, and when deals come out of the woodwork, you might find yourself with a chance to get The Most Sought-After Free Agent This Past Offseason. Don’t be afraid to trade your young athletic phenom starting center (who may or may not ever figure out how to play), go get The Most Sought-After Free Agent This Past Offseason!! It was not a basketball crime for the Almost-Bullets to start this rebuilding season with the goal and intention of playing McGee and Young major minutes to assess, once and for all, whether either player might turn a corner in their on-court comprehension and production (I would have said the same thing about ‘Dray, but he used up his very last benefit-of-the-doubt immediately after the first game of the season). But I agree with the good folks at Bullets Forever: The guys are “talented young players with NBA skillsets and were retarding the progress of this team.” Yes, almost all of the blame for that belongs to the dysfunction of the franchise the past four years, but that doesn’t change the reality. So the trade deadline really, truly was a good moment to say farewell, with plenty of latitude for what might be acceptable to fans in return. And I understand the various criticisms of the deal: traded young for old, locked in a fairly hefty four-year salary obligation on a player who hasn’t exactly wowed since signing his big deal with Denver, and health/injuries are undeniably a legit concern. Honestly, the thing that worries me most about the deal is that the GM on the other side is Denver’s super-impressive Masai Ujiri. Not only did I find this behind-the-scenes-in-Denver-at-the-trade-deadline show totally mesmerizing, it made me wish Masai were running for office here in D.C. so I could vote for him. Anyhow, I suppose from Denver’s perspective, the Nuggets ensured themselves of getting something for Nene by signing rather than letting him go for nothing in free agency, and McGee gets a 30-game audition to prove himself indispensable to the Nugs or a worthwhile target for a team with cap room to burn. 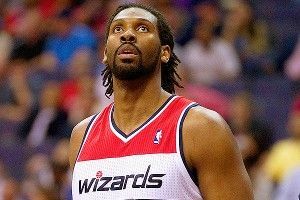 At least, I hope it’s that, and not some inside perspective on Nene’s long-term fitness to play professional basketball. In any event, the one takeaway that cannot be debated: With The Nick and JaVale Show on permanent hiatus here in D.C., the Dubya Pees took a dramatic turn toward less funny. I guess we will have to satisfy ourselves with the halftime entertainment.